Trying to find pubs in Lower Apperley? You’ve come to the right place. We’ve got every pub and bar in the UK listed. 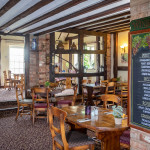 Whether you’re looking for a pub or bar in Lower Apperley to play darts, somewhere to play pool or just want to have a look at a menu before you go, we can help. The Farmers Arms is a lovely family friendly pub in the village of Lower Apperley. Serving excellent food and a lovely place for a drink or coffee too! The pub is a great spot to stop off, whether you're out for a cycle, walk or a country drive.